WASHINGTON – President Donald Trump had a number of confrontational exchanges with White House reporters Wednesday during a news conference to discuss the results of Tuesday’s election. Trump refused to answer a follow-up question from CNN reporter Jim Acosta, who persisted in his attempt to ask the president about the Russia investigation into interference in the 2016 presidential election. Trump spoke loudly over Acosta – with whom he has clashed repeatedly – and demanded he hand over the microphone to White House staff. “That’s enough,” Trump said repeatedly as Acosta continued to try to ask his question. When a White House aide tried to take the mic from him, Acosta yanked it back. Trump stepped away from the lectern for a moment before returning to the microphone. Trump has had several combative news conferences since he declared he was running for president in 2015, and he has consistently attacked media outlets for any coverage he considers unflattering (which he characterizes as unfair). He has repeatedly called the news media the “enemy of the American people,” a charge he also leveled against Acosta on Wednesday. Trump turned his ire on Alexander. Even as the news conference went on, Acosta thanked Alexander on Twitter. “I consider it to be an invasion,” Trump said. “As you know, Mr. President, the caravan was not an invasion,” Acosta replied. “Thank you for telling me that. I appreciate it,” Trump said sardonically. Later, American Urban Radio Networks correspondent April Ryan tried to ask Trump something while he was answering another reporter’s question about voter suppression. “Sit down, please. Sit down! I didn’t call you,” Trump told Ryan. He then finished explaining that he considered CNN’s “inaccurate” polling a form of voter suppression. When Trump called on another reporter, Ryan again tried to shout a question to the president. He repeated his demand that she sit down. “It’s such a hostile media. It’s so sad,” he said. “The president is not used to seeing himself lose, and he lost big,” Acosta said. Acosta also said Trump “time and again seemed to be attacking journalists of color,” referring to his exchanges with Ryan and Alcindor. Trump frequently attacks the media, and he often hones in on Acosta and his employer, CNN. Their clashes date back to the days before Trump even took office. Nine days before his inauguration, Trump attacked CNN for going “out of their way” to report on the salacious allegations against him in the “Steele Dossier,” which purported to outline Trump’s connections to Russia. Trump is rude and horrible person, but accuses others of being what he is. 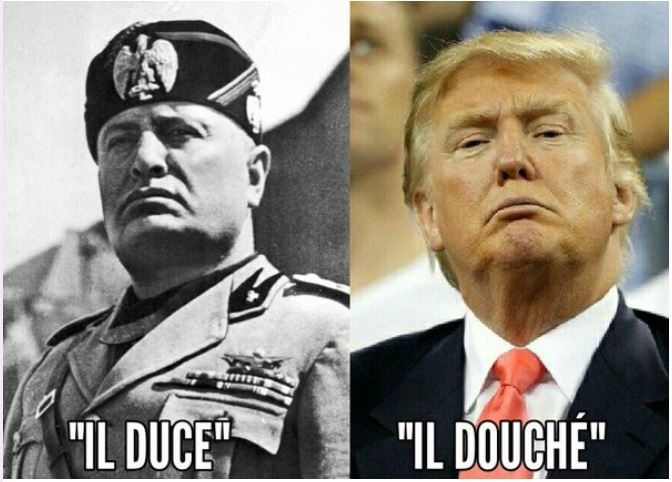 Trump has studied Mussolini’s behavior patterns, how else can this clown have the same behavior as il Duce? The White House video – Sanders tweeted an edited video of a C-SPAN recording which, she wrote, clearly documents the inappropriate behavior. Independent video experts, however, believe the video in the tweet may have been intentionally manipulated. Like Mussolini, Trump demands loyalty to his person, rather than to the nation. Like Mussolini, Trump threatens and humiliates anyone who opposes him. Like Mussolini, Trump attempts to discredit and cow the legitimate press. Like Mussolini, Trump becomes enraged when criticized. Like Mussolini, Trump is a “man of the banner headline” who is quickly bored by details, discussions and strategy. 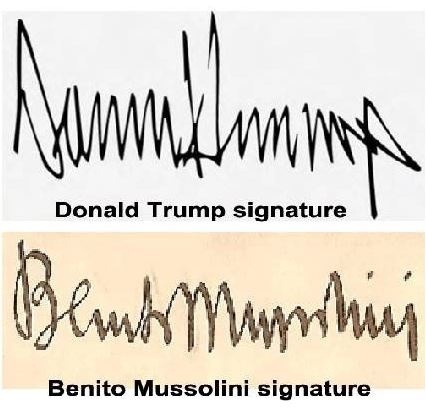 Like Mussolini, Trump takes all the credit when things go right, but none of the blame when things go wrong. Like Mussolini, Trump lacks any philosophy: he has only rhetoric. Like Mussolini, Trump gives the impression of talking directly to the people, while presuming to speak for them. Like Mussolini, Trump pretends to be an expert on every subject while in reality being incredibly incompetent and uninformed. Like Mussolini, Trump is closer to a Mafia don or gang lord than a democratic leader. Like Mussolini, Trump has had multiple wives, several mistressses and scores of adulterous affairs. Like Mussolini, Trump is working to strengthen laws against abortions, forcing girls and women to bear children they don’t want or can’t afford. Mussolini appointed his son-in-law as foreign minister; Trump has appointed his son-in-law as his primary foreign minister in the Middle East…. Disgusting how Trump treats journalists!